At the risk of sounding like an ultimate history geek, I’m going to encourage you to read more history in 2014. There are a number of books out now about facets of history that most of us never learned in school, and two works that I have read this fall have references to Indiana. “The Great Dissent: How Oliver Wendell Holmes Changed His Mind—and Changed the History of Free Speech in America” by Thomas Healy has a lot to say, particularly if you’ve been following the “Duck Dynasty” flap in the media. What we take for granted—you can say just about anything you want as long as it doesn’t endanger others and you’re willing to suffer the consequences—wasn’t always so. The United States in the early 20th century was undergoing remarkable change. You can read more about that change in Doris Kearns Goodwin’s work “Bully Pulpit: Theodore Roosevelt, William Howard Taft, and the Golden Age of Journalism”. (Brace yourself for a good…but very long….read at 750 pages before the footnotes.) Many of the issues that were dealt with then are being rehashed today—poverty, big business, worker’s rights, the value or lack thereof of going to war. In other words, history DOES repeat itself. But back to freedom of speech. Eugene V. Debs was the self-proclaimed “father of the Socialist movement”. He grew up in Terre Haute, IN. and served as that city’s clerk from 1879-1883 as well as being elected to the Indiana legislature in 1885. As a labor organizer, he was imprisoned in Illinois for his role the Chicago Pullman Palace Car Company strike. “During his prison term at Woodstock, Illinois, Debs was deeply influenced by his broad reading—including the works of Karl Marx—and grew increasingly critical of traditional political and economic concepts, especially capitalism. He also saw the labour movement as a struggle between classes. Sympathetic toward Populist doctrines, he campaigned for the Democratic-Populist presidential candidate William Jennings Bryan in 1896. After announcing his conversion to socialism in 1897, he led the establishment of the Socialist Party of America. Debs was the party’s presidential candidate in 1900 but received only 96,000 votes, a total he raised to 400,000 in 1904. In 1905 he helped found the Industrial Workers of the World, but he soon withdrew from the group because of its radicalism. Debs took upon himself a speaking tour of Illinois, Indiana and Ohio in 1918 in an effort to bait the government about the Espionage Act and its limitation of free speech. According to Claude Bowers, who heard Debs’ speech in Fort Wayne, “Debs did not utter a word to which the most supersensitive patriot could take exception. It seemed to me that he had prepared his speech with the realization that every word would be microscopically examined by secret agents”. Holmes would have, at one time, being strongly opposed to Debs’ speech. While noting in an opinion about a case involving Debs that there was no problem with Debs promoting socialism, which the Espionage Act did not prohibit, Holmes coined the phrase “clear and present danger” when referring to an intimation from Debs that the draft should be opposed. One of the best quotes from Goodwin’s book concerns Lincoln Steffens, a writer for McClure’s magazine, featured prominently in “Bully Pulpit” as a look at journalism in the Progressive Era as well as the presidencies and lives of Theodore Roosevelt and his friend William Howard Taft. Steffens wrote among other works “The Shame of the Cities”. He became friends with Roosevelt when Roosevelt was police commissioner in New York City. Steffens believed, according to Goodwin, that “the past was not a list of dates to be memorized but a series of questions to be continually debated”. McClure’s Magazine was founded by Samuel McClure, who spent his childhood after his father’s death, in Indiana. McClure worked as a teen for two years for Dr. Levi Cass, a wealthy Valparaiso doctor, to earn room and board to attend the new high school in that city. Roosevelt, McClure, Steffens and other notables of the twentieth century would all become forever linked with the Progressive Era and the “muckrakers”. Information on the back of this postcard says this is "Crowd listening to Theodore Roosevelt, Fort Wayne, Clinton and Holway Streets" The dates of the talk vary and so are listed as c. 1901-1910. A document in our archives entitled “When Teddy Came to Town” by Ben Meek tells of Roosevelt’s visit. William Jennings Bryan, Democratic candidate for president, had visited the city on September 10, and Debs, the Socialist candidate, on October 3, speaking at the Princess Rink on the southeast corner of West Main and Fulton. The building was a skating rink that was also utilized for public meetings. “The young and super-energetic Republican Vice-presidential Candidate and Governor of New York State, Theodore Roosevelt, arranged a swing through the pivotal state of Indiana by train on October tenth, eleventh and twelfth, 1900. Beginning at Hammond, he proceded (sic) to Lafayette by train and then on to Frankfort, Logansport, Peru, Wabash, Huntington and ending with an evening speech and rally at Fort Wayne. “ “The “Fort Wayne News”, the local Republican organ, devoted much copy to the plans for Roosevelt’s visit. According to the “News”, the Rough Rider Clubs with an enrollment of over one thousand men, were organized in Allen County and several local stores advertised Rough Rider Uniforms for sale. To generate interest and excitement in the visit of the ‘Hero of San Juan Hill’, a flag pole raising was held on Spy Run Avenue on October fifth. Several speeches were delivered, including some in German. 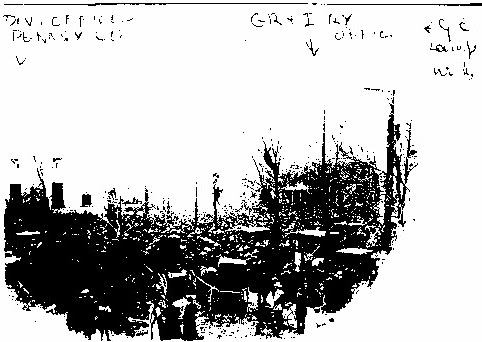 “On the great day, there were two parades, one in the afternoon and a larger one in the evening which started at the Barr Street Market and continued down Main Street to the Rink. The marchers included first, the mounted Rough Riders followed by their dismounted brothers, all of whom were in uniform. The Tippecanoe Club members, dressed in plug hats and uniforms, the older men in carriages, formed the Fremont and Lincoln Voters Section. There were the McKinley and Roosevelt Junior Clubs, members of which were boys and girls. The large German population was represented by the German Republican Club and was followed by the Colored Republicans and the Railroad Men’s Republican Club. There were two bands. Most of the marchers wore uniforms and probably carried kerosene torches, making a colorful procession. Bryan and his running mate, Adlai Stevenson, carried Allen County by 10,601 votes to McKinley/Roosevelt’s 8,172. But the state as a whole was won by McKinley, who would die from an assassin’s bullet in the fall of 1901, making Roosevelt the youngest president in US history.